To make your build as painless as possible and to get you off to a flying start we can provide you with a custom built trailer. Specifically designed for designing a tiny home on, the differences between our custom trailers and a regular cargo trailer are immense. Our trailers are manufactured to meet CSA standards, are fully road legal and come with their own VIN and are fully insurable. They are engineered to comfortably handle the weight of a tiny home, and axles, wheels and suspension are sized appropriately for tiny home weight. All lights, reflectors and Electric brakes included. 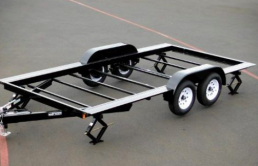 If you are not sure what weight capacity you need for your trailer, we can definitely help! See below for trailer pricing guide. We have a unique design that allows for 5 inches extra interior height compared with 99% of trailer manufacturers. We can include 4 levelling jacks welded into the corners to make levelling your tiny home a piece of cake. Saves so much time, effort and frustration from doing this the hard way. We pre drill our trailers in such a way so you do not have to drill a single hole through metal. You can simply attach the framing with bolts through our pre drilled holes. Another time consuming job you do not have to do! And you don’t burn out all your drills! We can instruct on how to attach your framing to the trailer, including the bolts, screws and brackets that you need. So there is no guessing on your part if you are a new tiny home builder. If you feel confident putting together an ikea coffee table, you can frame on this trailer. However, we are always a phone call away, so if you get stuck don’t hesitate to call. Fill in our form below to get a quick custom trailer quote. Prices in Canadian Dollars. Taxes not included. Let us know if you are interested in one of our custom trailers and we can discuss options.